The Uranium King executive team are based in the United States and consist of Mike Duncan and Sam Sapper. These gentlemen are responsible for the management of the exploration programme for the company and deliver to Uranium King combined uranium and mineral exploration experience totalling around 75 years. Michael Duncan earned his BS in Mechanical Engineering in 1967 and as a young engineer he represented the Boeing Aircraft Company and McDonald Douglas Aircraft Corporation on such projects as the 757 Airbus, the Saturn V missile, and the Manned Orbital Space Laboratory. In 1970, he returned to the University of Arizona to attend the MBA program. This experience prompted a career change, and in 1971 Mike became a principal in a Tucson based real estate investment syndication firm. In 1973 he was asked to become Acquisition Director for a public company, MultiVest, Inc, which was, at the time, the largest blind-pool limited partnership in the United States. In 1979, Mike became the co-founder and president of the U.S. Equity Corporation, an Indianapolis based investment and development Company which was, and still is, active in the acquisition and development of commercial property in several states within the United States. In addition to major properties in Pennsylvania, Ohio, Florida, Colorado, and other areas of Indiana, the firm has developed approximately 2 million square feet of office and industrial space in the Indianapolis area alone. Mike remains a major share holder and director, but is no longer involved in the day to day activity of the firm. Mr. Duncan has been active in uranium exploration since 1992, and is currently a director of METCO and the president of INEXCO, a global investment firm. Sam Sapper has been involved in major mineral exploration projects worldwide. His first employment was with Inco based in Canada where he was responsible for large scale, airborne and ground geophysical work and the assigning of drill targets for early phase mineral deposit evaluation. Sam then joined Falconbridge and worked on projects throughout Australia, South America, Africa, Canada and the United States with duties including geophysical orientation and analysis of geological environments and the selection of most the most effective exploration techniques. Sam then accepted a position as international vice president of Soil Test Inc. of Chicago, Illinois where he was co-director of technical training and was responsible for upgrading their geophysical line of manufactured geophysical equipment. While at Soil Test Sam was responsible for the creation of Geneva-Pacific, which became the mineral exploration arm of Belden Corporation, a major producer of electric cable and electronic equipment for the electrical industry world wide. He was also a member of the technical team that pioneered the development of fibre optic cable for Belden Corporation. SAm also managed the selection of 2.5 million acres from 9 million acres that the U.S. government allocated to the combined Alaskan Indian Nations. This area contained the Red Dog Mine and other mines which Sam’s Geneve Pacific group discovered in the five years they were involved under Sam’s direction. SAm was also appointed as a technical mission member to the World Bank to assist underdeveloped countries in their mineral development projects. Sam has also been involved with Phoenix (McPharr) Geophysics of Denver, Colorado and O’Hara Resources, an exploration and mining company based in Reno, Nevada. Whilst at O’Hara Sam was involved in the development of projects in Montana, U.S. and Ghana, West Africa. Mr. Sapper is currently an independent geophysical and geological consultant and a director of METCO. Karl Meyers has been actively involved in the exploration and production of uranium since 1954. He has made significant discoveries in every major uranium producing area of the continental United States, with the exception of the in situ leach fields of Nebraska and the Gulf Coast of Texas. Between the years 1954 and 1960, Karl made the original uranium discovery in the Shirley Basin, engineered open pit uranium mines in Wyoming, and underground mines in Utah. In 1956, as Field Engineer for Anderson Development Corporation, Karl placed the first drill hole in five significant uranium deposits in Ambrosia Lake, New Mexico, including the largest, the Section 30 Mine. In 1962, he discovered the Meyers-Jennings uranium ore body in the Gas Hills of Wyoming, and in 1968, he discovered one of Uranium King’s current holdings, the Rio Puerco uranium mine in New Mexico. This discovery was termed by the USAEC as the most significant US uranium discovery of the 1960’s. 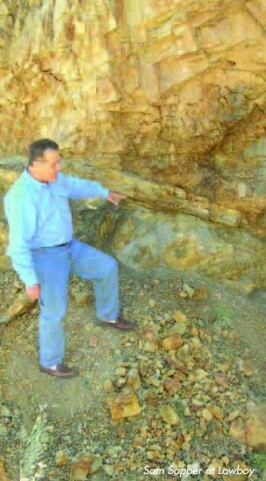 Public records show that Karl has been responsible for placing the first drill hole into more than 10% of all uranium mined in the United States to date. He is a nationally recognised authority in the discovery, development, and production of uranium, and has been a guest speaker on the subject, both in the United States and internationally. Several periodicals, including Barrons, have published his work.